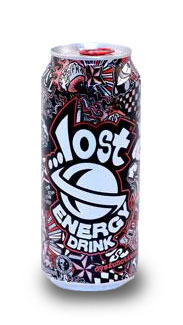 Lost Energy is a brand of energy drink manufactured by Hansen Beverage Company for surf-industry icon Lost Enterprises, which has a worldwide cult following for its surfboards, surf/skate apparel and accessories. The original Lost Energy drink formulation seems to be virtually identical to the highly successful Monster Energy drink, also produced by Hansen. Lost comes in a can with a unique, graffiti-mural style designed as part of their partnership with Lost Enterprises, whose target market is hip, 15-25 boarders (surf, skate and snow). Varieties of the drink include Lost Energy (Monster Energy equivalent), Lost Five-O (Monster Khaos equivalent), Lost Energy Big Gun (Monster Assault equivalent), and Lost Perfect 10 (Monster Lo-Cal equivalent). All four varients come in 16 fl oz cans, and Lost Five-O and Lost Big Gun also come in 24 fl oz cans.